The best young talent of Kirin Arts High School, JB, is attracted attention of fans. 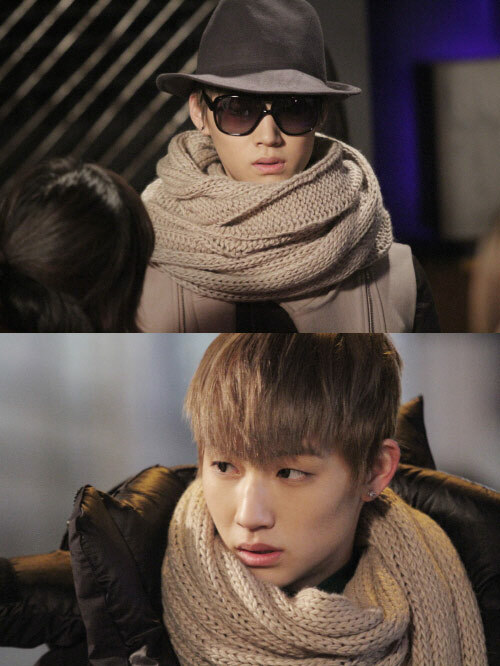 In the KBS 2TV Monday and Tuesday drama series Dream High 2, the still photos of leader of the best ideol group l:dn (Eden), the perfectionist talented youth JB, were released. The published photos are of the conflict scene between Jin Yoo Jin (2AM’s Jung Jinwoon) who is performing on a street near Hongik University and his arch enemy JB. The onlookers on the filming scene were completed conquered by the handsome look of JB and strong charisma. JB who debuts in entertainment industry through the “Dream High 2” is the champion of fifth season of JYP’s public audition. He is the second-generation star with outstanding ability. 2PM’s Jung Wooyoung who plays the role of Jason in Dream High was the champion of first season of audition. The audition of JYP has high prestige and rate of competition. In this drama, JB is appearing with the real name. He can sing, can dance, can rap, and perform perfectly the acting that he has prepared. He will conquer the hearts of female viewers with double charms of cute and strong charisma. JB said, “Very honored to be able to let audiences know me through Dream High 2. Although very nervous in the beginning, there were some shortcomings, but my friends gave me a lot to help making the shooting very happy,” expressing the anticipation and nervous mood for the drama. In addition, “Dream High 2” tells the story about a big Korean entertainment company will takeover Kirin Arts High Schoo, while the students of Kirin Arts High School is engaging in team to team competition in order to become the best idol group. The drama debuts January 30th, 2012.